A phenomenal garden doesn't have to cost an arm and a leg. 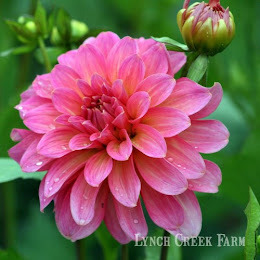 You can have summer show-stopper flowers for a modest price when you start with dahlia tubers, and when you start with dahlia tubers on sale at Lynch Creek Farm, it costs even less. This week's features: Glorious pastels! Colorado Classic: Andy loves this one for use in wedding bouquets. 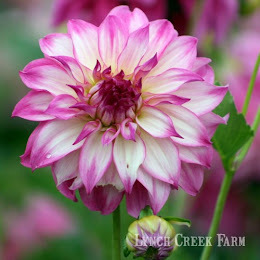 An informal decorative dahlia, it has lavender-pink and white wavy petals that recurve toward the stem. "A stunner," Andy says. "It has wonderful petal structure and an amazingly long stem for cutting." Colorado Classic grows on a five-foot plant. Its blooms are classified as "small," measuring four to six inches across. While it is hugely popular as a cut flower, it's beautiful in the garden as well. Excentric: A terrific late cut flower, Excentric has incredible color. To call it pink is to oversimplify; it has overtones of peach and lavender with a suggestion of yellow in the center of blooms that look upward. A shorter plant, Excentric grows only three and a half feet tall and looks stunning in a mixed border. It makes an excellent cut flower with good, sturdy stems. It's classified as an informal decorative with miniature blooms two to four inches across. Just Peachy has simply luscious peach-colored flowers in a light blend flowing from yellow to salmon to pink. The blooms are deep and four to five inches across. The gang at the Farm love it for use as a cut flower, noting it has good stems. Introduced in 1986, Just Peachy has been a consistent show winner. It is categorized in form as a semi-cactus dahlia. It's a favorite with gardeners, with prolific blooms on a five-foot plant. Park Princess is a big, bold, bright pink flower on a sturdy little bush. Marvelous form manifests itself in spiky style: its furled petaloids pale at the tips to almost white. It lends itself beautifully to the garden border or to use in a planter. While Park Princess plants grow only about two feet tall, its flowers are four to six inches across. 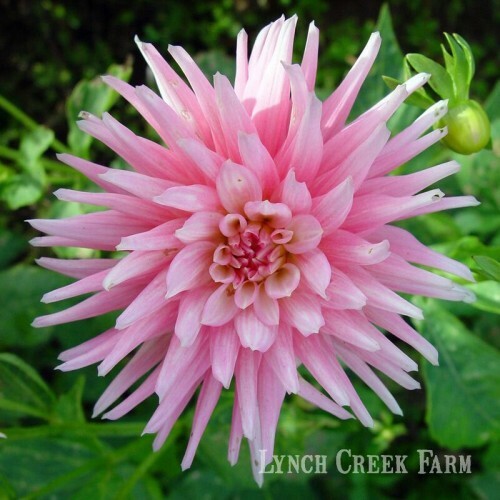 This one's a true cactus dahlia, a show-off you'll enjoy year after year. Keith H. features another wonderful color range from pale to golden yellow, with the edges of the petaloids lightly brushed with red-orange in the center of the blooms. In form, Keith H. is classified as a waterlily dahlia. Blossoms are four to six inches across and beautifully regular in form. Abundant flowers make it equally at home as a showy garden flower and a good cut flower. If you want to get e-mail notification of weekly dahlia bargains, go the the Farm's Web site; on the right-hand side of the home page and fill your information in the "Get Dahlia Updates" space. 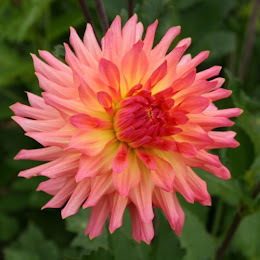 Hit "Subscribe" and you'll receive notice of great savings opportunities and other dahlia information. You'll also find chances to win $50 credit toward dahlias for 2014 when you go to the Lynch Creek Dahlias page on Facebook and "Like" the Farm.